Mosaic House is Full for the Holidays! Our new housemate, Charles Jones (third from left), moved in recently to give us a full house for the holidays. We are excited for a new season of openness and sharing in the way of Jesus. Our hearts are open, and submitted to God’s work in and through us. To God be glory! Mosaic House resident, Josh Brown, created a new prayer box to collect prayer requests from our neighbors and all who visit us. After receiving the requests, we pray through them during our morning prayers together. Soon, we will create a prayer mailbox in our front yard for those walking by our house. We would love to pray for you! Please submit any prayer requests to Mosaic@Mosaichouseministries.org and we will follow up with you. Week in and week out, Mosaic House resident, Kevin Deming, blesses our community with a warm, homemade meal. Every Monday, we pray together and enjoy fellowship. There is always room at our table! We are thrilled to have Jalen Jones join the Mosaic House family. He brings many gifts to the community, including preaching, teaching, and mentoring! Jalen says, "Throughout my life I have naturally been a leader in any area I have been in and I enjoy being around people. I also love the word of God and being in His presence and talking about His word, and since I have been in college and have had a chance to speak a couple of times I noticed that my passion is preaching and leading others to Him. I don’t know how God plans to use it or where or how often, but I know that I will be in ministry and that God is going to use my passion that I have for speaking His word, and loving people. Whether it is pastoring a church or some other type of role, it will involve speaking and people. As Mosaic House resident, Joshua Brown, spent time painting on the porch, neighborhood youth became curious about his work. It became a powerful moment when one of the youth said, "I want to learn to paint like you, too," and Josh had the opportunity to speak life and limitless possibilities. Praise be to God! For years at 1644 Park Ave, we have gathered every Monday night at 7:00 PM to seek God's Kingdom together in our community. 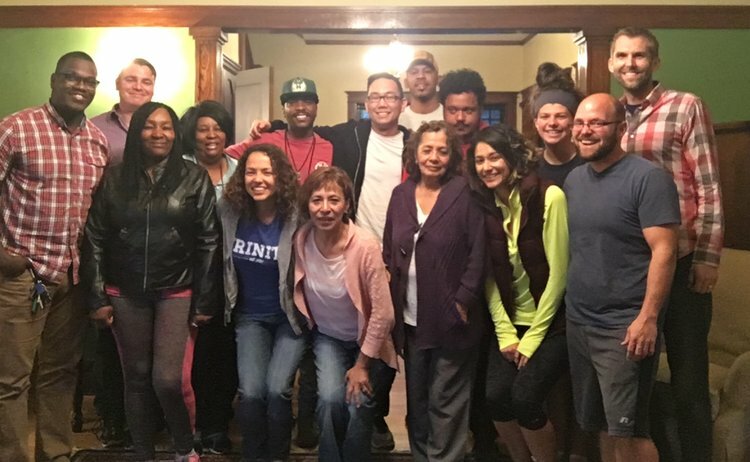 Afterward, we enjoy a home cooked meal from our gifted chefs who reside at the Mosaic House! All are welcome. God's Kingdom come. We are very excited about the Grace Hong Prayer Room. Grace was an incredible woman of prayer and devotion to God. We are deeply humbled to have this dedicated space in her honor at the Mosaic House. Our next door neighbors, Rick and Annette Hill, coordinated and executed the design and buildout of this sacred space. Many others helped as well to make this possible, giving discounts on materials and free consultation on color schemes and design. 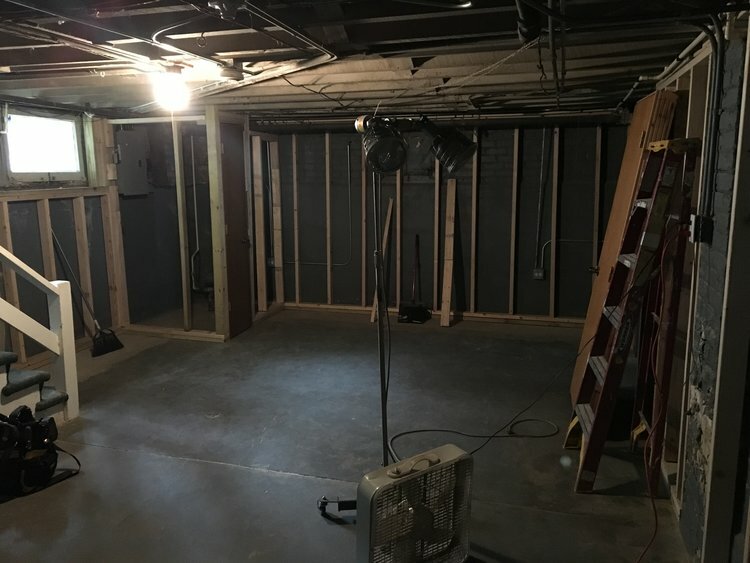 We look forward to filling this space with furniture, musical instruments, and art work. Hallelujah! We are thrilled to have Joe Lewis join the Mosaic House family. He brings many gifts to the community, including cooking great meals! Joe says, "My hope is that this degree will allow me to become a Naval Chaplain and eventually, a full time theologian and reformer. It’s a bit of a struggle to find specifically when and where God wants me to go but he pointed me in the direction of Mosaic and the Mosaic house, so I’m trusting in him to lead me to where he wants me to go in my life." Our neighbors have been celebrating their son's birthday and the Fourth of July with a block party for the past ten years. After moving into the Mosaic House, the Hills asked if we would like to partner in this celebration. Of course, we were delighted to support such a fun and positive event in our neighborhood! This year was the biggest yet, with gospel artists coming in from out of state, and with local vendors selling homemade goods. The Hills put an amazing amount of work into this event, and with great gratitude, we would like to acknowledge their generosity of time and financial resources. As we prayed before, during, and after the celebration, may the songs and words that were sown in faith bear much fruit! To God be the glory. Mosaic House resident, Josh Brown, leads a Fellowship of Christian Athletes (FCA) Bible study at North Chicago Community High School. The following is written from one of his students. Praise be to God who saves and redeems! Finding my true faith was the best thing that happened to me. I say “True Faith” because I always knew of God, but I didn’t live my life through God. In other words, I didn’t think it was as important as I do now. I was always a good kid until 6th grade. I started hanging around a bad crowd, being influenced, and learning bad habits. It wasn’t until the end of my 8th grade year I found my faith in God and that’s where I found a girl to take up all the time I had for running the streets and getting in trouble with the law. We started to go to each other churches on Sundays and we would sometimes talk about our favorite scriptures. My Sophomore year is where I found my “True Faith”. Around November 2016, I remember it was the worst time of my life. First I lost my Grandfather, the only person my mother relied on, I lost my job, sports weren’t working out much, I lost the girl who meant the world to me, and I was starting to lose my faith in God. Suicide starting to cross my mind; I’ve never felt so weak in my life. I remember the day I obtained my “True Faith”. It was on a Wednesday, which the day we hold FCA, an after-school Bible study group, held by upcoming Pastor Josh Brown. Although, I was sitting distance from the small group we had that day, the Words that spoken to me from his mouth was, “If God is your friend, best friend, or whatever he may be that hold a bond between you and God. How do you expect continuous favors from God if you don’t speak to God when you don’t need a favor or to even just recognize him?” Then he continues to say, “If you had a friend and they only talk to you when you have a bag of chips in your hand because they want some, would you want to do anything for that person?” Then that day I realized that God probably wanted my attention, so he taken some of those things from me. From that day to present, I have gotten Baptized and started to live my life through Christ, who continues to strengthen me. My life has been full of opportunities and blessing since. Best decision of my life was going to that FCA meeting. We had the joy of celebrating our brother Isaac and commissioning him from the Mosaic House with love and prayer. Isaac has accepted a pastoral position in Los Angeles, CA. For our commissioning service, we took turns speaking words of encouragement and calling out the ways God has gifted Isaac. After a rich time of sharing, we prayed into these words and visions with the laying on of hands. Isaac joins a community of brothers who have likewise been commissioned from the Mosaic House and are now serving God around the country (and a few in other countries). Many of the guys share things like, "I grew in ways I never thought possible, both spiritually and in insight of both my weaknesses and my strengths. God used the Mosaic House to transform my life." Praise God. It is our prayer that as Isaac leaves, he will create similar spaces and places for transformation in his ministries. May God's Kingdom come! Please know you always have family here. We are with you. We carry one another’s stories. Please always let us know how we can pray for you. “God knew that WE Needed one another—Our call was not to not be fragmented/scattered people—but to be a people who are whole—who are together—who are unified. Because of Jesus, we can be border crossers and bridge builders—and sojourners together. We can be the Beloved Community." So then you are no longer strangers and aliens but you are fellow citizens with the saints and members of the household of God, built on the foundation of the apostles and prophets, Christ Jesus himself being the cornerstone in whom the whole structure, being joined together, grows into a holy temple in the Lord. In him you also are being built together into a dwelling place for God by the Spirit.